Woody Allen makes another good movie. That's not entirely true. Since Bullets Over Broadway's release in 1994, I have liked two of his films — Match Point in 2005 and Whatever Works in 2009. However, Midnight in Paris definitely deserves the label as the first great Woody Allen film since Bullets. As Donald Rumsfeld said of the Iraq war, it's been a long, hard slog for Woody fans who used to anxiously anticipate each new Allen offering before his films turned into retreads of previous works and tasted like a fifth night of leftovers. With Midnight in Paris, his muse returns and blesses us with a fully formed, funny, thoughtful piece of cinematic inspiration. Most people heard the news that Midnight in Paris stood tall in the Allen canon months ago when the film opened, earning raves and becoming his highest-grossing film ever. I had to wait for DVD and retain a healthy skepticism until I saw it. I simply had no other choice. During the nearly two decades that Woody toiled in the artistic wilderness, people burned me far too often by insisting Allen's latest belonged in his win column only to discover the opposite when I viewed the film. After I finished watching Midnight in Paris, it seemed as if those 17 years had been erased magically. I actually had to check IMDb because my brain couldn't conjure the titles of some of the forgettable films he churned out in those years — Small Time Crooks, Melinda and Melinda, Scoop, Cassandra's Dream, You Will Meet a Tall Dark Stranger. That doesn't even take into account the ones so bad I couldn't bleach the stain they left on my cerebrum such as Celebrity, Curse of the Jade Scorpion and Hollywood Ending. Midnight in Paris washes away those transgressions, clears the slate and renews my hope that inside the 76-year-old filmmaker there still exists things worth saying and movies worth making. As many of Allen's films that he doesn't star in do, Midnight in Paris features a Woody surrogate and, in what might appear to be an unlikely casting choice, Owen Wilson gets to be his stand-in here. Selecting Wilson as the Woody Allen substitute turns out to be the first of many grand decisions the writer-director makes. In fact, I'll go further and declare that Owen Wilson makes the best faux screen Woody yet (and let's hope we never endure one worse than Kenneth Branagh's in Celebrity). Wilson plays Gil Pender, a successful Hollywood screenwriter with an attractive fiancée named Inez (Rachel McAdams). The couple tag along with Inez's ultra-conservative parents (Kurt Fuller, Mimi Kennedy) on a trip to Paris where Inez plans to be lazy and sight-see while Gil hopes the City of Lights ignites his first attempt at writing a novel. Paris casts a spell on Pender almost immediately, even though it's raining at the time, something that annoys Inez. "Why does every city have to be in the rain? What's so wonderful about being wet?" asks Inez, a woman Gil unconvincingly describes to strangers as charming but who looks to outsiders as a high-maintenance, judgmental snob. It doesn't take long in France for Gil to suggest that they should move there, but Inez doesn't understand what's so terrible about living in Malibu and being a rich screenwriter, especially with as much trouble as Gil tells her he's having with his novel. "I'm having trouble because I'm a Hollywood hack who never gave literature a real chance until now," he replies. Pender hates his job because he doesn't write anything of value and before we even get to Allen's major themes in Midnight in Paris, he appears to be submitting himself for some self-criticism over his output in recent years. When he made the atrocious Hollywood Ending, the movie was a one-joke notion that the industry had devolved to the point that a director no one realized had gone blind could make a movie and still deliver a box-office smash. In Midnight in Paris, (at least I hope this is the case) he's taken the same complaint and aimed it inward and disposed of it in pieces of dialogue as appetizers to a bigger and better cinematic dinner. (Besides, as far as Hollywood Ending goes, I'd submit Kurosawa and Ran as a counterargument for what blind directors can accomplish.) Gil's novel's plot teases us as to what the main course will be as it tells the story of a man who owns a nostalgia shop, selling memorabilia relating to bygone days. While Gil and Inez wander the city with her parents, they bump into Inez's old friends Paul and Carol (Michael Sheen, Nina Arianda) and soon the two couples visit all the sites together where Paul, an unctuous know-it-all on all subjects makes it a point to show off his expertise to anyone and everyone, even telling the tour guide at the Rodin museum (played by French first lady Carla Bruni) that she has her facts wrongs). Paul embodies a 21st century representation of the man pontificating in a movie line in Annie Hall that Alvy fantasizes about bringing Marshall McLuhan out to chastise. Watching the laid-back Wilson do the annoyed Woody dance at this character type not only proves hilarious but a refreshing twist on the familiar routine. Every word Paul utters, of course, enthralls Inez, who believes he's as brilliant as he thinks he is. It's also a nice change of pace for Sheen to play a fictional creation for a change instead of impersonating famous British people. Paul probes Gil about the subject of his novel and at first, Gil resists discussing it, but Inez spills the beans and the movie's argument gets rolling — namely, is the grass really greener in the other era? Gil romanticizes the Paris of the 1920s, when so many great artists from America and elsewhere flocked there. Paul pooh-poohs the notion immediately. "Nostalgia is denial. Denial of the painful present," Paul declares. Inez, the woman who allegedly loves Gil and wants to spend the rest of her life with him, takes Paul's side in the browbeating. "Gil is a complete romantic. I mean he would be more than happy living in a complete state of denial," she says of her fiancé. Paul isn't able to discuss any topic unless he does it at length and in long-winded lectures, so he has to show everyone what he knows of this "syndrome." "The name for this fantasy is Golden Age thinking. The erroneous notion that a different time period is better than the one one's living in now," he pronounces. Having had enough of being a foursome one night as Paul suggests they all go dancing, Gil begs off, choosing to return to the hotel and perhaps work on his novel. Instead, he walks the streets. As he sits on some steps, a clock strikes midnight and an old yellow Peugeot pulls up as if it's the pumpkin that turned into Cinderella's carriage. The antique automobile bears '20s-era Frenchmen and Frenchwomen (who may have been mice once — who can say?) drinking champagne and beckoning Gil to climb in for a ride. That's when the real sparkle of Midnight in Paris begins and it involves another Woody Allen venture into a magical realm. Gil doesn't speak French, so he's clueless as to what his fellow passengers might be saying as they take him to a party where everyone dresses decidedly retro. Fortunately, most of the other guests appear to be American or at least speak English, so communication isn't a problem. A young man (Yves Heck) sits at a piano, playing and singing, "Let's Do It, Let's Fall in Love." He mentions to one guest that he's a writer and they introduce him to Scott (Tom Hiddleston) and his wife Zelda (Alison Pill) — the Fitzgeralds. Gil finally realizes that somehow, that mysterious Peugeot took him on a very long drive — one that traveled nearly 100 years in reverse to his ideal Golden Age where he could mix and mingle with his long-dead artistic inspirations. In the past, when Allen employed these fantastical devices it began to feel as if, to paraphrase one of his oldest jokes, he'd resorted to cheating by looking into the soul of the guy sitting next to him, only in these instances, he wasn't seeing another person but staring at himself in a mirror. Magic tricks which first played a key role in the "Oedipus Wrecks" short of New York Stories would return in Curse of the Jade Scorpion and Scoop or, to a lesser extent, assume the form of magical herbs in Alice. Actual Greek choruses would arrive to comment on the action in Mighty Aphrodite or see-through characters would pop up in the form of Robin Williams in Deconstructing Harry. This is a well that Woody drinks from often except that it works best when he employs it in service of larger ideas such as in Zelig, The Purple Rose of Cairo (which I still consider his best film), and, now added to that list, Midnight in Paris. As Midnight in Paris enthralled me, a small detail leaped out early on. In both Purple Rose and Midnight, he names one of the leads Gil. In the case of Purple Rose, most tellingly, the actor that Jeff Daniels plays who creates the role of Tom Baxter, the movie character who steps off the screen and into 1930s New Jersey, bears the name Gil Shepherd, only that Gil embraces his burgeoning stardom and hopes a B-picture such as "The Purple Rose of Cairo" raises his stature high enough to nab the lead in a Charles Lindbergh biopic — as long as his doppelganger in the pith helmet doesn't wreck his career. 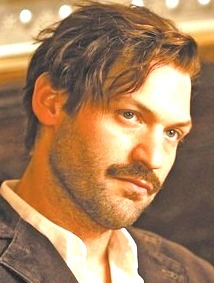 Gil Pender in Midnight in Paris may work in the same industry, but he fears he's sold his soul to it and he wants out. The first night that Gil takes his trip back to the 1920s he also encounters Ernest Hemingway (played by Corey Stoll in the film's most entertaining performance). Fitzgerald introduces them and Gil gets the envious position of talking writing with Papa in the movie's best exchange on writing that'll appeal to anyone who has ever put pen to paper. It begins with Gil being self-deprecating about the subject of his novel (of course, no one in the 1920s has the faintest idea what a nostalgia shop is), calling it a terrible idea. "No subject is terrible if the story is true and if the prose is clean and honest, and if it affirms grace under pressure," Hemingway tells him. Gil then works up the nerve to ask if the author would look at what he's written and offer suggestionss. HEMINGWAY: My opinion is I hate it. GIL: But you haven't read it yet. HEMINGWAY: If it's bad, I'll hate it because it's bad writing. If it's good, I'll be envious and hate it all the more. You don't want the opinion of another writer. Hemingway does offer to give Gil's manuscript to Gertrude Stein (Kathy Bates) to read, because he's always trusted her opinion. They agree to meet the following night and Gil leaves but suddenly remembers he forgot to ask Hemingway where to meet him, but when he turns back the coffeehouse has turned into a laundromat and Gil finds himself in 2010 again. In the morning at his hotel, he attempts to explain his adventure to Inez, asking her what she'd think if he told her he met Zelda Fitzgerald and she's exactly like they had read and Scott really loves her and worries endlessly, but she hates Hemingway because he's right that she's standing in the way of his writing. When Gil completes his enthusiastic rambling, Inez replies, "I'd think you had a brain tumor." Gil manages to convince Inez to go back with him the next night to wait for the Peugeot, but she grows impatient and takes off before the clock strikes midnight. After Inez has left, the Peugeot arrives and takes him to Gertrude Stein's apartment where Hemingway awaits and Pablo Picasso (Marcial Di Fonzo Bo) paints his current mistress Adriana (Marion Cotillard), who catches the eye of both Gil and Hemingway. Despite the many larger-than-life figures than circle Adriana's world, she finds herself just as drawn to Gil — until she learns of his engagement. She also shares Gil's Golden Age thinking, While he thinks that she lives in the greatest time period, she thinks it's awful and wishes she could have been in Paris during the Belle Epoque of the late 19th century. Meanwhile Gil's behavior in the 21st century becomes so bizarre that his father-in-law-to-be hires a private eye to tail him on his midnight walks to see what Gil does on them, since he doesn't trust anyone who says such nasty things about the Tea Party. Even when Allen had fallen into his long slump, he still had the ability to attract some pretty solid ensembles, not that they were given much to do. 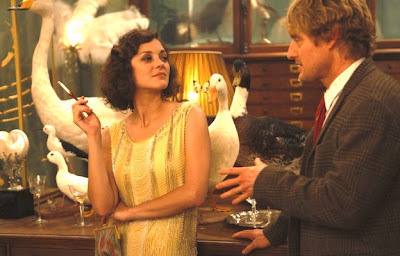 In Midnight in Paris, the casting shines with a mix of lesser-known performers and bigger names, all bring their A game to Allen's greatest screenplay in 17 years. In addition to Wilson and Stoll who I've mentioned, the cast's standouts include a zany single scene by Adrien Brody as Salvador Dali, Kathy Bates, Michael Sheen, Rachel McAdams, Marion Cotillard in the first performance she's given that I've enjoyed and, most worth noting, Alison Pill as Zelda Fitzgerald. Pill to me proves again she's an actress just waiting to break out. She's funny and touching here after giving a good dramatic turn in Milk and being part of the fun ensemble in Scott Pilgrim vs. the World. 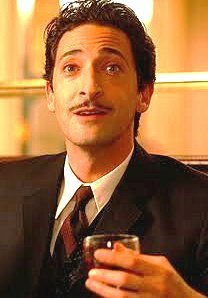 Given how many great lines Woody's script for Midnight in Paris delivers, it's tempting to rattle them all off, but I'm resisting the urge for those who have yet to see this charmer, but I have to mention one of my favorite gags when Gil runs into a young Luis Buñuel (Adrien de Van) and gives him an idea for a movie — basically the plot of his film The Discreet Charm of the Bourgeoisie The Exterminating Angel — but the young Buñuel doesn't get it and keeps asking Gil why the dinner guests can't just leave the dining room. Gil tells him it may come to him someday and Buñuel didn't end up releasing the film until 19721962. If there has been any debate about Midnight in Paris, it's been where Allen comes down in the end on the question of nostalgia and Golden Age thinking. It seems pretty obvious to me based on what Gil's last line to Adriana is, even though he sends mixed signals by having Paul, the film's most pompous character, ridicule the idea of Golden Age thinking first. Also, as others have pointed out, throughout most of Allen's career his choices in music and references have screamed nostalgia, but Midnight in Paris plays as one of the most entertaining self-critical works any artist has ever made. At the same time, Allen does acknowledge the natural reflex to long for an earlier, better time — if not in another era, at least in one's own life. I agree absolutely with your assessment of this this film. I would only add that although it was nowhere near the level of Midnight in Paris, Vicky Cristina Barcelona has improved to some degree in my estimation on a second viewing, although the criticisms I voiced in my initial review still stand. Welcome Back, Woody...we've missed you, son! Great review! The only critic I have about it is that the movie Wilson refers to is "The Exterminating Angel," and not "The Discreet Charm of the Bourgeoisie". You are correct. I'm getting all my Buñuel dinner party movies confused. However, Midnight in Paris definitely deserves the label as the first great Woody Allen film since Bullets." I don't agree. I thought that "MIDNIGHT IN PARIS" was a boring and trite movie, filled with empty charm and a complete disappointment.